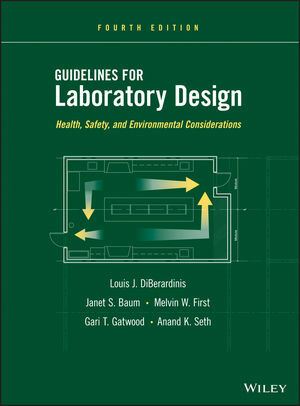 Now in its Fourth Edition, Guidelines for Laboratory Design continues to enable readers to design labs that make it possible to conduct scientific investigations in a safe and healthy environment. The book brings together all the professionals who are critical to a successful lab design, discussing the roles of architects, engineers, health and safety professionals, and laboratory researchers. It provides the design team with the information needed to ask the right questions and then determine the best design, while complying with current regulations and best practices. The final part of the book features five appendices filled with commonly needed data and reference materials. This Fourth Edition is indispensable for all laboratory design teams, whether constructing a new laboratory or renovating an old facility to meet new objectives. LOUIS J. DiBERARDINIS, BS, MS, CIH, CSP, is the Director of Environment, Health, and Safety at MIT. He is a visiting lecturer at Harvard University School of Public Health and Adjunct Professor at the University of Massachusetts Lowell in the Department of the Work Environment. He received his BS in chemical engineering from Northeastern University and an MS in industrial hygiene from Harvard University. JANET S. BAUM, BS, MArch, AiA, currently teaches part-time at Harvard University School of Public Health and at both the Graduate School of Architecture and Urban Design and the Institute of Public Health, Washington University in St. Louis. She earned her BS in architectural sciences at Washington University in St. Louis and her master of architecture at Harvard University Graduate School of Design. The late MELVIN W. FIRST, ScD, CIH, PE, was a researcher and professor of environmental health Engineering at the Harvard School of Public Health for almost sixty years and was actively involved in research until a week before his death. GARI T. GATWOOD, BSME, CSP (retired), is a consultant in safety engineering. He has forty years of safety experience in missile defense, commercial chemicals, laboratories, and university programs. He holds a degree in mechanical engineering from the Missouri School of Mines and Metallurgy in Rolla, Missouri. Anand K. Seth, BS, MS, PE, CEM, CPE, is currently an Engineering Principal in Cannon Design, an international architectural/engineering firm. Seth worked at Massachusetts General Hospital as director of engineering and at Harvard University. He holds a master of science in mechanical engineering from the University of Maine and has done postgraduate work at other universities.